Devil's Pool is located in the Wissahickon Creek. 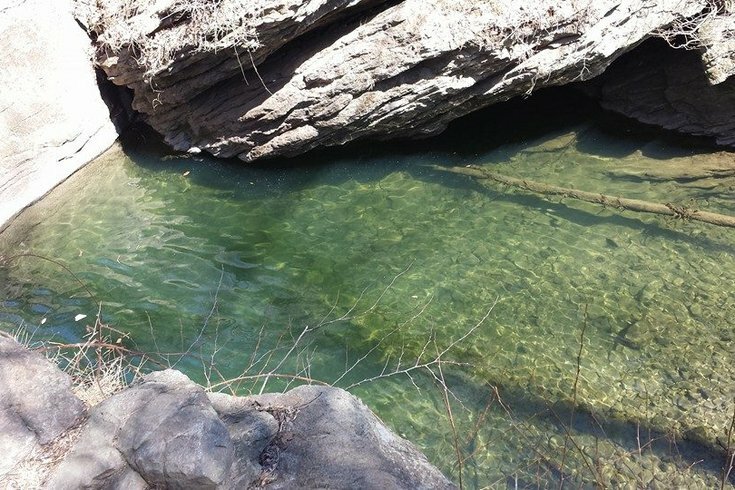 Philadelphia Parks & Recreation is reportedly cracking down on swimmers headed to the dangerous Devil's Pool on the weekends. The swimming hole in Wissahickon Valley Park will be closed on the weekends through September, said Parks officials, who noted the orange and white trails which lead to the site will be closed at Livezey Lane and at Valley Green Road. Devil's Pool is a notoriously popular, illegal, pollution-ridden, rock jumping basin that empties into Wissahickon Creek. It's surrounded by large boulders and, when rain levels are high, it can swell to create a large basin that tempts swimmers to jump in from the rocks above. People who jump and linger at the site have been injured, killed and suffered broken bones (which often goes unreported). City and park staff have been trying to crack down people gathering at the site for years to ensure public safety. Why shouldn’t you swim in Devil’s Pool? A committee task force formed by city officials has stepped in to warn people of its dangers, especially with all of the rainfall we've had this summer. Plus, there are no lifeguards, poor cellphone service in the event of an emergency, and dangerous undercurrents inside the hole. The rest of the Wissahickon Valley Park will be open and other trails will still be available to hike on the weekends. To view other trails in the Philadelphia area, click here. Need to cool down? Try a free public pool. Here's a map of all the city's pools.